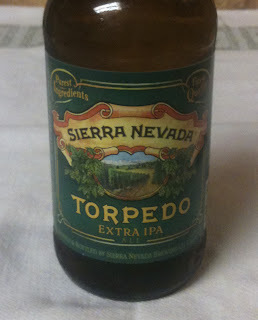 Tonight is another IPA - Torpedo Extra IPA from Sierra Nevada Brewing Company. The web site lists the IBUs at 65. It came in a twelve ounce bottle, listing a 7.2% ABV. 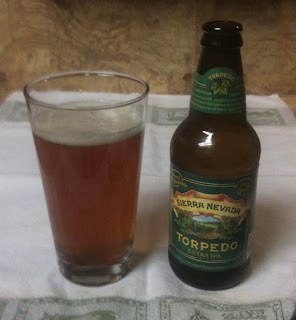 The Torpedo poured with a small head, and is a golden honey color - not much red or brown to the coloring. Very light aroma. This beer is a little heavier, and probably medium+ in strength. There are some hops and bitterness, and a little citrus, but they seem to be cut some by maltiness. It doesn't have the in-your-face hops of some heartier IPAs. There is some bitter aftertaste. This is a good beer for someone who likes a little heavier beer, but doesn't want a hops overload.